1 Blessed is the man who doesn’t walk in the counsel of the wicked, nor stand in the way of sinners, nor sit in the seat of scoffers; 2 but his delight is in Yahweh’s law. On his law he meditates day and night. 3 He will be like a tree planted by the streams of water, that brings forth its fruit in its season, whose leaf also does not wither. Whatever he does shall prosper. Today's promise contains the first three verses of the first chapter in the book of Psalms. What a way to start this wonderful book. These precious verses tell us that we will live a blessed life when we choose not to take counsel from the world system but to delight in the Word of the living God. 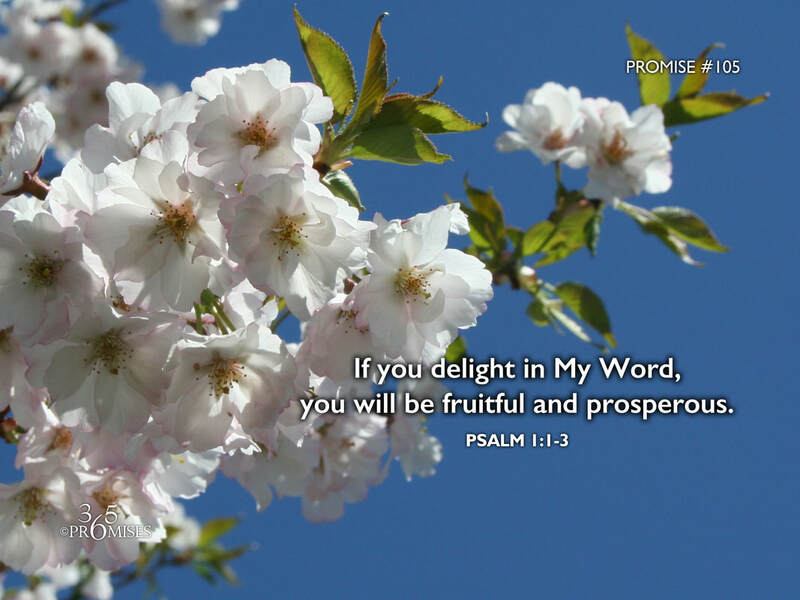 We are told that if we delight in the Lord and in His Word, we will be like a tree planted by rivers of water, always bearing fruit in the appropriate season, all the while living a prosperous life. I don't know about you, but when I read Psalm 1:1-3, my heart cries out, I want to be that man! I want to live a life that is pleasing to my God and to delight, meditate and be a manifestation of His Word to every one around me. Simply put, God loves us and He wants to bless us in every way. When we listen to Him, when we delight in what He delights in, we have His promise of being fruitful. My prayer today is that we would all say yes and amen to this promise and claim it as our very own. May each one of us love what our Father loves, and choose to live a life of delighting in His ways.